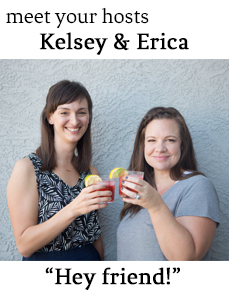 We recently presented on podcasting at the Mom 2.0 Summit in Scottsdale, and we're finally catching our breath to debrief. Hear all about our awkward moments, the cool people we met, and how it went. We also recorded this on Mother's Day (Erica's first), so cheers to all the mamas out there! Have yourself a mojito. In each glass, muddle two lime wedges, two slices of kiwi and a few torn mint leaves. Add ice to each glass along with a shot of mint simple syrup* and a shot to a shot and a half of rum. Top with sparkling water or lime La Croix (how do you say it?). Stir, sip and enjoy. In neighborhood news, we are happy to report on the success of the corner bakery, neighbor baby is having a rough week, and one neighbor has made an unfortunate paint color choice.